From the lovely older homes in Middle Village to all the apartment blocks on Queens Boulevard (and their street level retailers), Queens has seen many generations pass through, some to stay forever. If you own any of these properties now, and they were built before 1978, you inherited a big problem with your history: Asbestos. It is a health hazard and it has to be removed. As the first name in asbestos abatement (removal) and asbestos remediation (site cleanup) in Queens, with more than 25 years experience, we can help. Asbestos was used in most of the building materials up to the late 1970’s including asbestos siding and insulation, flooring and roof shingles, asbestos-filled sheetrock and plaster and all those asbestos vermiculite “popcorn” ceilings found everywhere in Queens. When these materials age, they start to degrade, releasing asbestos into the air—and the lungs of those exposed. But the detection of asbestos can only be accomplished by testing the air for these invisible fibers, so we send in an independent firm to sample the air. 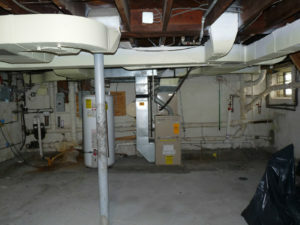 If asbestos is found, abatement begins immediately. Our crews are licensed, insured, certified and highly trained. They will set up a decontamination zone and negative air machines to ensure that no asbestos escapes into the air during abatement. Then they scrape all the asbestos away and dispose of it off-site in a designated facility. When remediation begins, all exposed areas where the asbestos was, get resealed and the zone thoroughly cleaned, using special equipment, before the air is retested. When tests show no trace of asbestos is left, only then do we sign-off on the job and allow your tenants or family back into the building—now a safe environment. For asbestos remediation and abatement services anywhere in Queens, call (877) 645-1428.